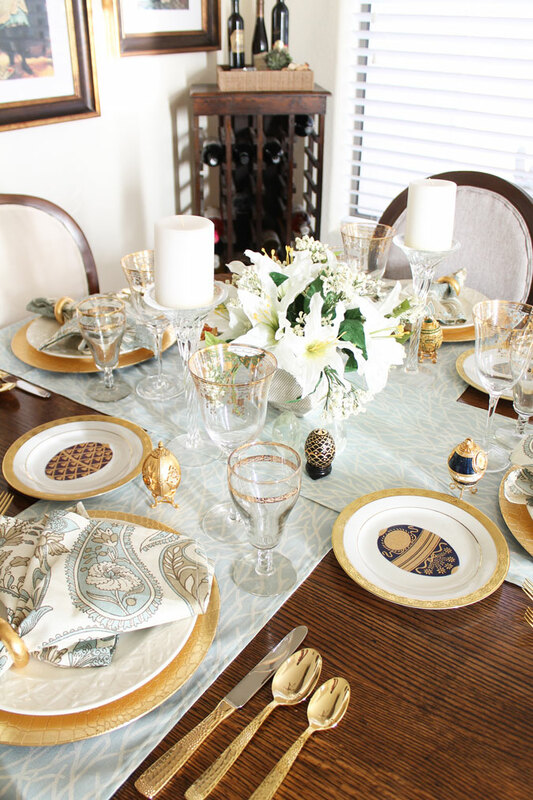 We all love to have a pretty tablescape for any occasion, and I think especially for the holidays. Easter is such a wonderful holiday where we dress up for Church to remember our Lord Jesus and children hunt for pretty dyed eggs and the Easter Bunny brings beautiful baskets filled with toys and treats. 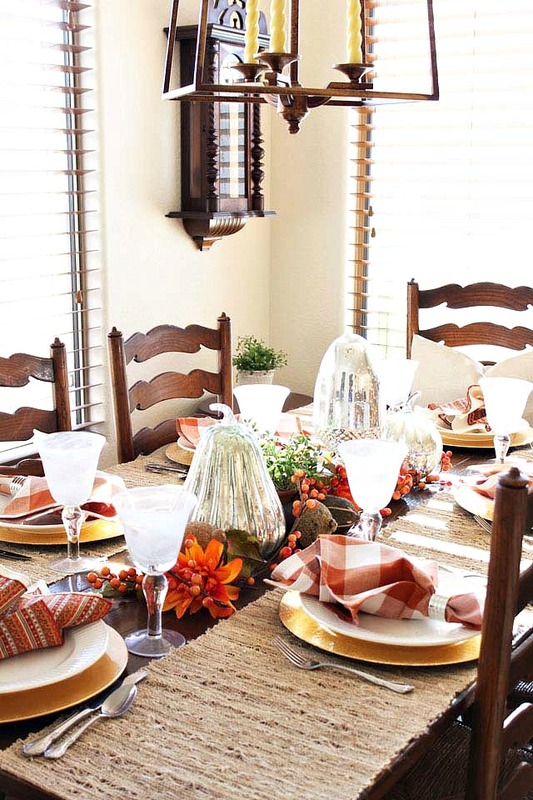 All the family gets together to share in the Holiday Festivities and to enjoy a fabulous meal. 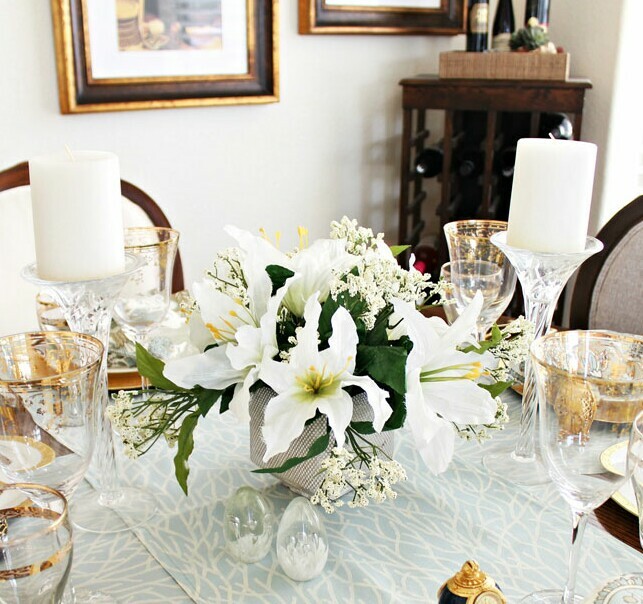 Setting a pretty table for the occasion can be daunting, but it really is so simple and it doesn't have to be expensive. I like to start with either table runners or placemats. The table runners I am using I made from $3 yd remnant fabric. I just cut the size to fit my table. If you don't sew you can just turn under the edges and press with an iron. Since I am setting the table for 4, I chose to use two runners that I crossed on the table. Next I made a floral arrangement out of Dollar Tree flowers. I used two branches of Easter Lilies and one branch of filler. Add in some candlesticks if you would like to. Again look at Goodwill, you will find all kinds of candlesticks. I see glass or brass ones all the time, or you can spray paint wood ones. The 99 cent stores has candles all the time too. Next I like to add in my basic dinner setting. 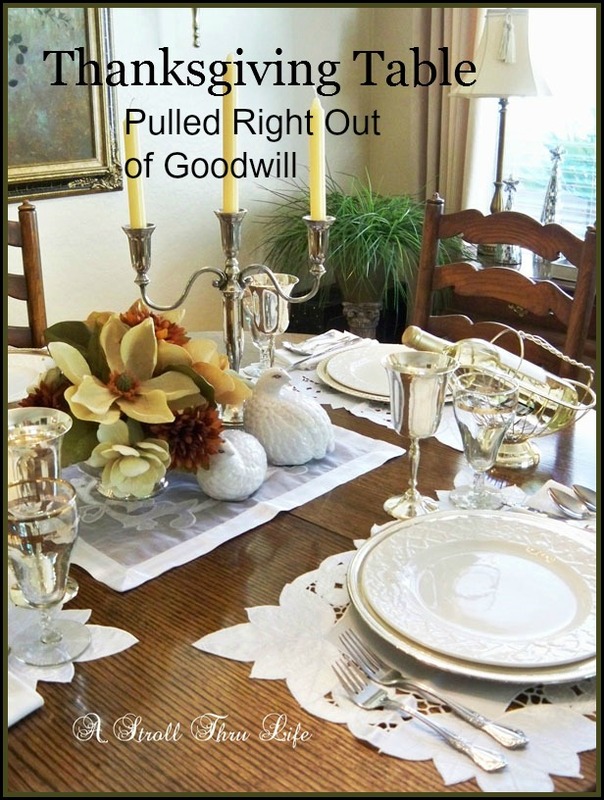 This is definitely when you can find amazing dishes and accessories at Goodwill and the 99c stores. These chargers came from Goodwill as well as the dinner plates. I often find beautiful napkins there too. Ross & TJMaxx are also great places to find inexpensive napkins - usually around $6 for 4. I used gold flatware that was a gift, but you can use your everyday flatware too. Next I love to add my pretty stems. The tall stem came from Goodwill. They always have tons of stems of all kinds. I see pretty frosted or cut glass ones often. The 99c stores also have some beautiful stems in clear and colors. The shorter stem I am using was my mother-in-laws that I inherited. 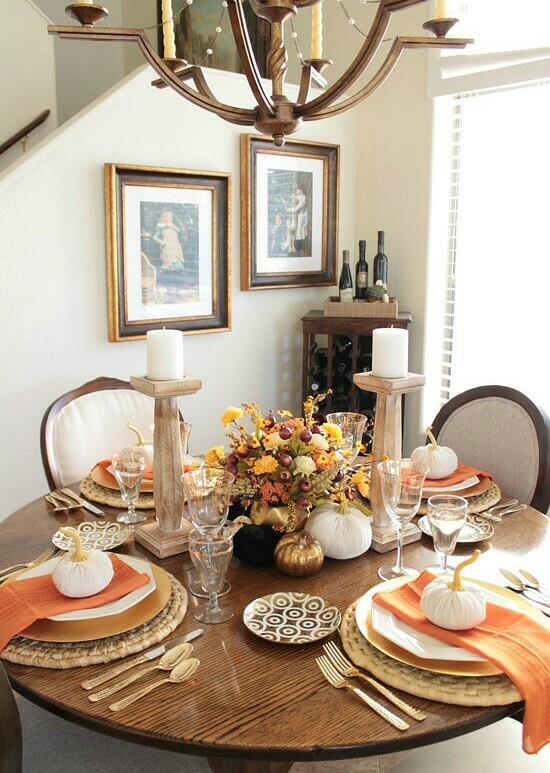 At this point we can stop and have an amazing tablescape- or we can add in some seasonal decor of some kind if we want to. 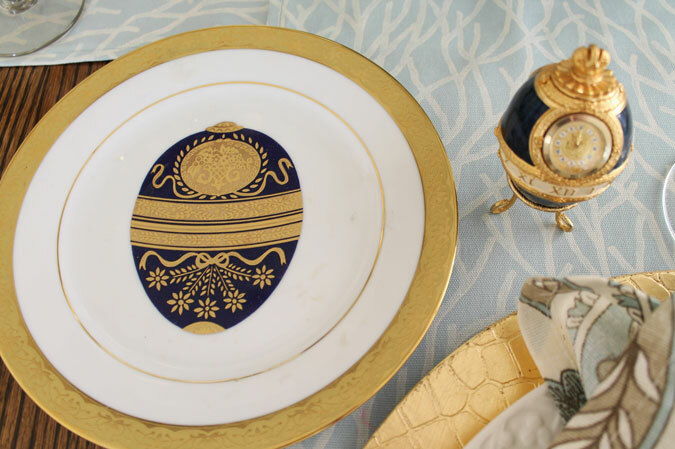 I have a collection of Faberge Eggs and Plates that I collected years ago. Easter is a favorite time to use them. A simple white salad plate or bowl would look just as good. 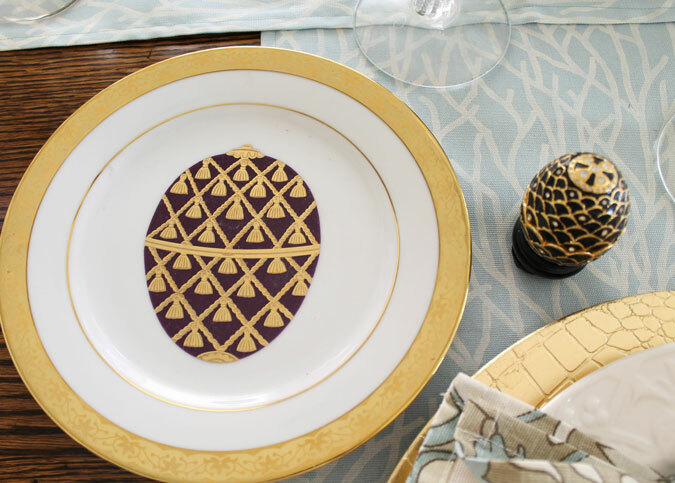 You can use napkin rings to display a pretty dyed egg or - cut sections off a toilet paper roll and paint them a pretty color. They are perfect to display an egg on. how about using a Candy Rabbit or Peep next to each setting. With that you are finished and it was super easy and so inexpensive. Now you can just accept the compliments that your guests will be handing out. Since my dining area and living room are one long space, I like to keep the color scheme the same. Once you have collected a few basics, you can create so many different tables for any occasion. Here is the same basics used to create a different table. and a few more different ideas that are so easy and can adapt to any style table. This is my farmhouse table in the breakfast area. I love using two runners on this table too. 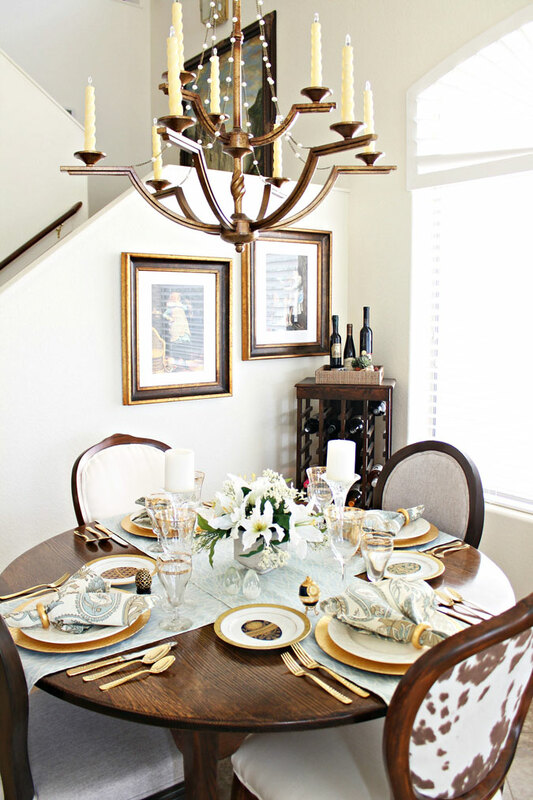 It creates a nice place for each place setting to sit. All of these brass candlesticks I found at Goodwill too. 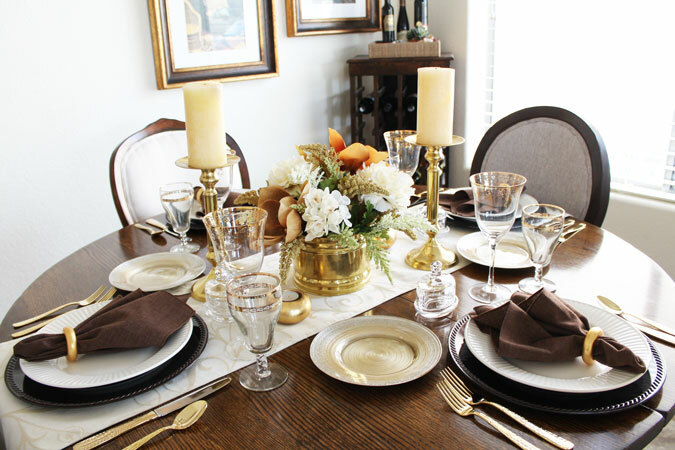 This is a different farmhouse table setting using some of the same items. This is a similar table to today's Easter table. 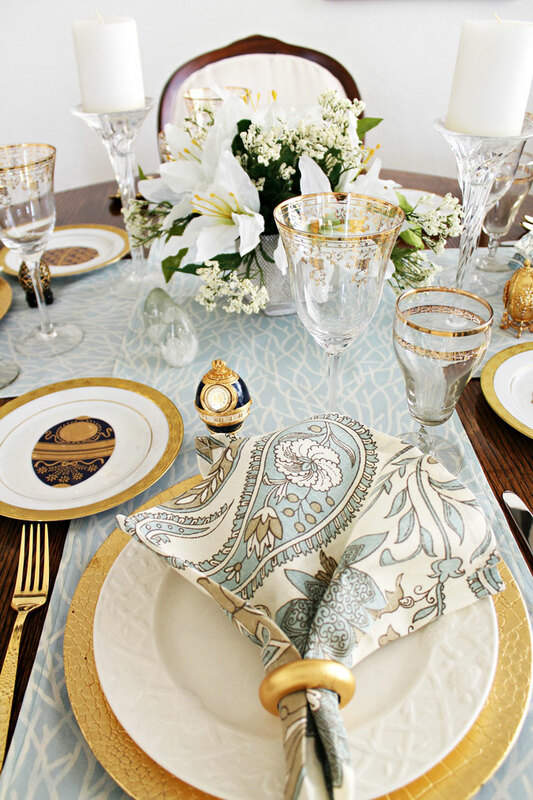 Different napkins and centerpiece, but a lot of the items are the same. Again this table is repeating a lot of the same dishes. Do you see what all was repeated again here? Some repeats again in this table too. Just mix things up. 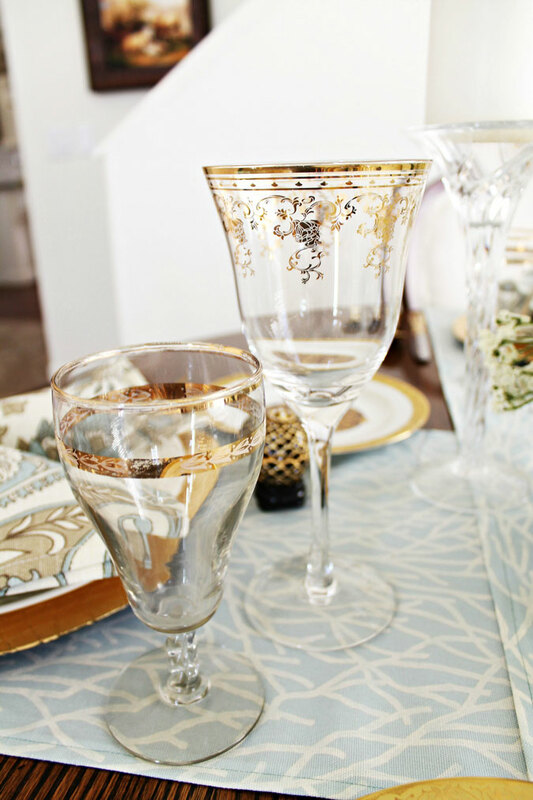 Same runners, dishes and stems used in so many tablesettings before. Just add different napkins and centerpiece. Here's a beautiful table pulled together with Goodwill finds that I see everyday at any Goodwill. 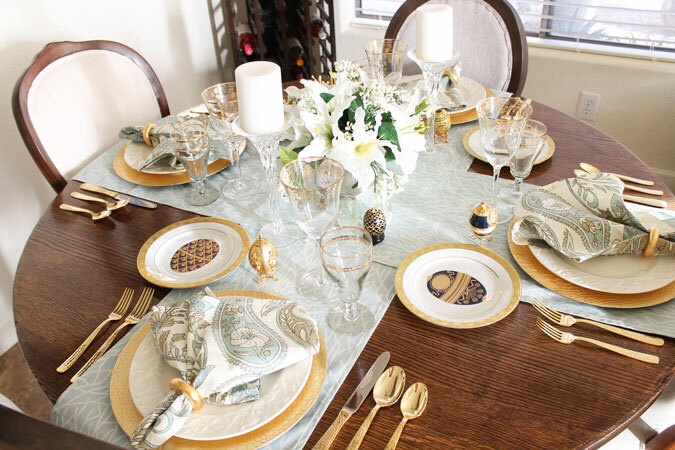 Collect a few basics and you can mix and match and create a different tablescape for any occasion. Beautiful Marty. 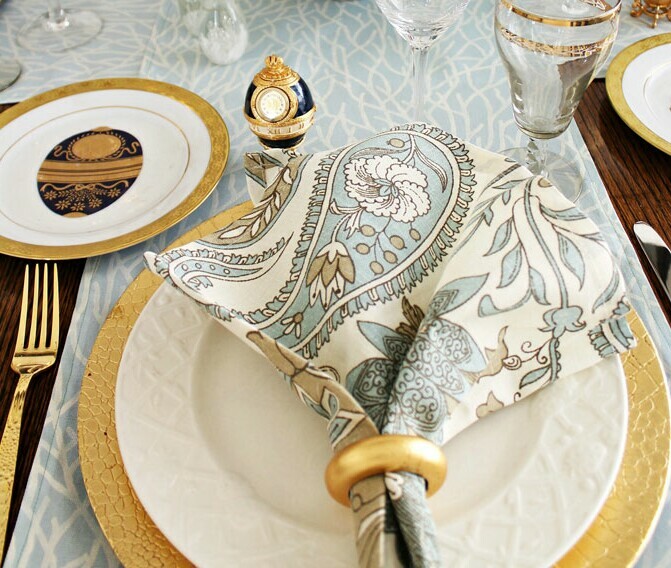 I love the pattern on your napkins, and the egg plates. Great contrast. 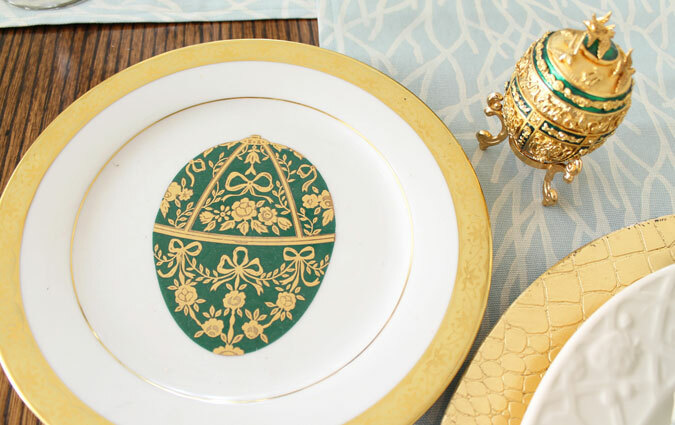 Your Easter table is lovely, and thanks for the easy tutorial. I have many thrifted items but now I'll start collecting things for a lovely table setting. Thanks for the tutorial. Marty this is so pretty. I love your napkins. The pattern and colors are gorgeous. Beautiful inspiration. ثمة طريقتان من أساليب عزل الأسطح، وهما: العزل الحراريّ، والعزل المائيّ، وسنتطرّق في ذلك الموضوع لكليهما: العزل الحراريّ هو حظر حدوث التّبادل الحراريّ بين القاعات التّي تتباين في درجة حرارتها، وتحدثّ تلك الطّريقة باستعمال مواد عازلة للحرارة، كالصّوف الصّخري، وهو ذائع الاستعمال، ويكون على شكل ألواحٍ يتم إلصاقها بالسّطح، أو باستعمال المزايكو، والذّي يوضع فيه الصّوف الصّخري على شكل لفائف، تفرد على سطح البيت، ثمّ يصبّ فوقها الإسمنت، ومن المواد الأخرى المستخدمة في العزل الحراري، هي مادّة البيرلايت، ويحدث فردها على السطح، وهي مادّةٌ عاكسةً للحرارة. 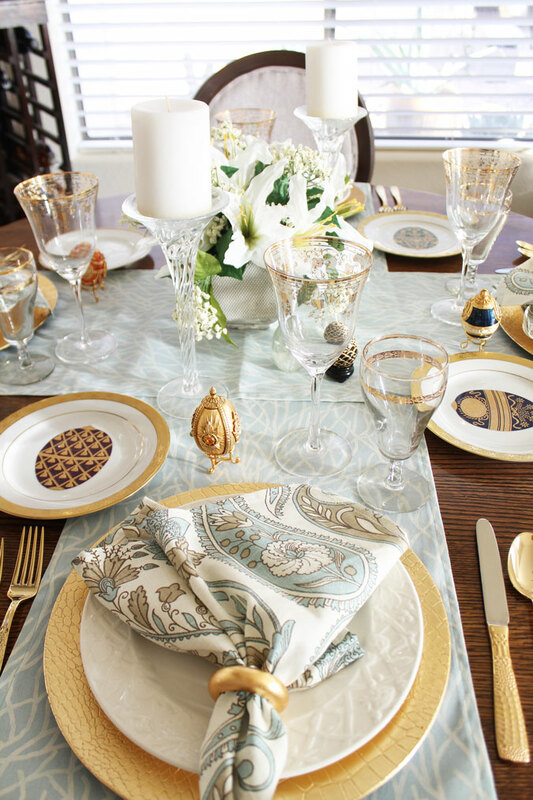 I love how the soft blue runner calms all the gold within your Easter Tablescape! 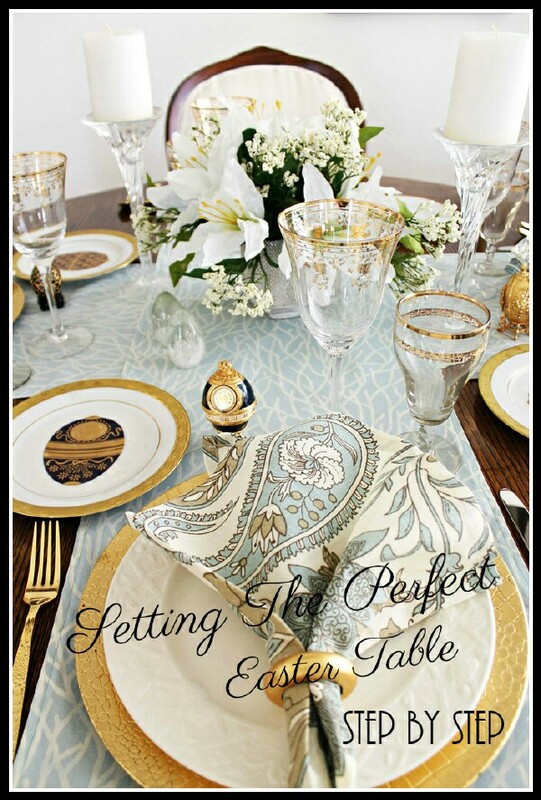 Both tables are decorated perfectly for the Celebration of Easter!